There are many benefits to eating foods in season. There is no comparison between a “fresh, in-season strawberry” with its vibrant red hue and bursting flavors and one that is dense, less than sweet and “out-of-season”. One approach to getting more flavor and nutrients per bite, and to add variety to your diet, is to eat foods in season. For those of us who live in climate zones that experience the changes in seasons, the spring equinox brings anticipation with it! We daydream of warmer weather ahead! A new growing season is upon us that will turn the deadened brown landscape into shades of lively green that are dotted with colorful blooms. Many of those blooms will be harvested in the months ahead as apples, cherries and pears; but for now these blossoms are celebrated in festivals the world over! When the weather changes with the seasons, we change the clothing we put on our bodies. After all, it’s not healthy to be sweating under a wool winter coat and heavy sweater when the spring temperatures are in the 70’s or 80’s. This got me thinking about adjusting my diet by season. If we wear seasonal clothes, why not eat foods in season? In the northern zones, lighter foods such as leafy greens and soft skinned fruits are plentiful as the temperatures warm. Fall provides the harvesting of heavier produce such as apples, potatoes, and winter squash that store well through the cold winter months. These dense, carbohydrate rich food sources help maintain our bodies through the cold winter weather. Mother Nature seems to bestow us with food gifts suitable to our climate….maybe she does know best! Our food selection today is very different from our “hunter-gatherer” ancestors who were only able to catch or harvest foods in season indigenous to their area. Our modern supermarkets offer today’s consumer a variety of food choices on a grand scale. Fruits and vegetables that could be out-of-season locally are shipped to your neighborhood store from another part of the country or world. Plant based foods grown in winter greenhouses also add to the variety. While we have variety, there is an argument to be made as to the nutritious quality of fruits and veggies shipped long distances to market. The journey produce takes, from being picked in the field to being placed on the shelf, could take a week or longer. That pint of strawberries could have logged hundreds or thousands of miles before it takes up residence in your refrigerator. If you only grocery shop once a week, you can extend this travel time a few more days until that strawberry finally makes its way to your table and consumption takes it to its final resting place. So what does the harvest-to-consumption time span have to do with nutrition? From the time a vegetable or fruit is picked it starts loosing nutrients through a process called “respiration.” Plant based foods remain alive after harvesting but this adds to the loss of nutrients, flavors and textures. Some plant foods “breathe” slower than others which give them a longer shelf or nutrition life. Apples and onions breathe slowly and therefore maintain their nutrient density longer than asparagus that breathes fast and quickly loses nutrients. This is why eating foods in season is so important! If we step away from produce for a minute and look at protein sources like meat and eggs, there are differences to be considered as well. In spring, pasture grazing steer and cows are able to graze on the newly sprouted green grasses. They will now consume a new set of nutrients from these fresh, chlorophyll rich, green plants they eat. Chickens that roam and are cage free also are nourished by the awakening of the earth. (Did you know that chickens produce more eggs in the spring and summer than other times of the year?). The nutrients these conventionally raised animals receive from fresh pastures follows through to the meat, milk and eggs they provide. Arugula is best grown when the weather is slightly cool (spring and fall) and makes for a wonderful, healthy salad. Vidalia onions are the state vegetable of Georgia and are typically harvested from late April through mid-June. These sweet onions are grown in soil with low sulfur content which brings out their sweetness and are wonderful toppings on salads and burgers. Asparagus is part of many traditional spring dishes. Full of phytonutrients, asparagus is a perennial vegetable that returns every year, only to be harvested when its stalks are just rising inches above the ground. Left to its own accord, an asparagus spear will grow into a willowing bush. Squash blossoms may not be the first thing you list on your weekly menu, but they are worth a try! Stuffing them with cheeses or making blossom fritters are a wonderful late spring delicacy. 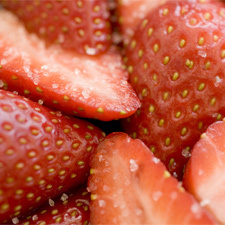 Strawberries are probably one of the most celebrated spring fruits with many local festivals held in their honor. Vine ripened and sweet, these luscious little berries are great alone, on top of salad, or paired with the “not-so-celebrated” rhubarb plant. Finding local foods in season in your grocery store is as close to a local farmers market as you may get. I personally enjoy belonging to a local organic co-op that provides me with seasonal treasures and surprises. Every week, the farmer sends an email listing the contents of my produce box along with recipes. He tells about the successes and struggles of the growing season which makes me take personal interest in the food I am consuming. You never know what new food you will be exposed to with the co-op. Every Friday is like Christmas to me…I never know what “presents” I’ll find in my produce box. One year, “garlic scapes” became my favorite find of the season. The young tender stalks of the garlic plant are harvested before the bulb turns into the familiar white garlic bulb. They are sweet, not bitter, and are wonderful raw or cooked. While everyone may have their local favorite foods in season, I bet there are a few you haven’t tried. With a little adventurous spirit, you never know what may become the “Pièce de résistance” of your spring meals. Spring seasonal savory is simply splendid… enjoy! Lee Ann Cimperman is a Dr. Sears L.E.A.N. and Prime-Time Health Coach and a health and wellness advocate. She has taught fitness and martial arts for over 10 years and has coached children, families, and adults to build strong bodies and strong minds. As an adult, Lee Ann returned to school to follow her passion in life which is a holistic approach to health and nutrition mixed with culinary arts. She is the owner of Olive Tree Health and Wellness in Pittsburgh, PA which provides both national and local health and well programs, workshops, lectures and online classes.